Less than two hours from the mainland, but another world entirely; find yourself intoxicated by the colours, creatures and atmosphere of Lord Howe. The sky darkens. looking out to the Tasman, the sullen clouds slowly engulf the last of the day’s golden luminescence. It’s not just the spectacle of dusk that’s extinguishing the highlights from the tops of palms and dimming the bright green around us. And it’s not the ethereal tsunami of tropical mist that seems to be cascading from the flat-top peak above. It’s something else entirely. And it’s getting denser with each passing minute. The ‘something else’ is not silent and it’s not still. It swirls around in big, dark loops from ocean to mountain. It screeches and squawks like an orchestra of dogs with chew toys. Standing on a slip of land between dense palm forest and a lapping shore, we’re in the fixed axis of a centrifuge of frenetic, winged action. Making their raucous return to roost for the evening, the endemic Providence petrels of Lord Howe Island swarm as noisily as tweenagers at a Bieber concert. But there’s another sound in the falling dusk that’s stirring these birds into greater frenzy. A woop-woop-woop seems to be emanating from my companions. Their hands clasped around their mouths to extend the sound, they call the petrels from the sky. The birds oblige, awkwardly. landing for these stout, pigeon-like creatures. Instead, responding to the call, they tumble out of the sky like newspapers tossed haphazardly at a lawn by an indifferent paperboy. A ‘thump’ indicates one has attempted a landing and a wait ensues as you watch it struggle to propel its plump body through shrubs and grass to investigate the ‘woop-woop-woop’. I witness one struggling to free itself from a tuft of grass for a good five minutes. It’s lucky these birds have no predators here (there are no snakes or foxes on Lord Howe and dogs require a licence), because their ungainly ineptitude on land and their curious, guileless nature is a diabolical combination for longevity as a species. As it is, Lord Howe is the only rookery for these birds in the world and their diminutive population size makes them vulnerable. We watch those who’ve responded to the call peck at our shoelaces before we set off back through the kentia palm-fringed track away from Little Island. The squawking dims behind us, but the memory of this unfathomable and unique experience will not. 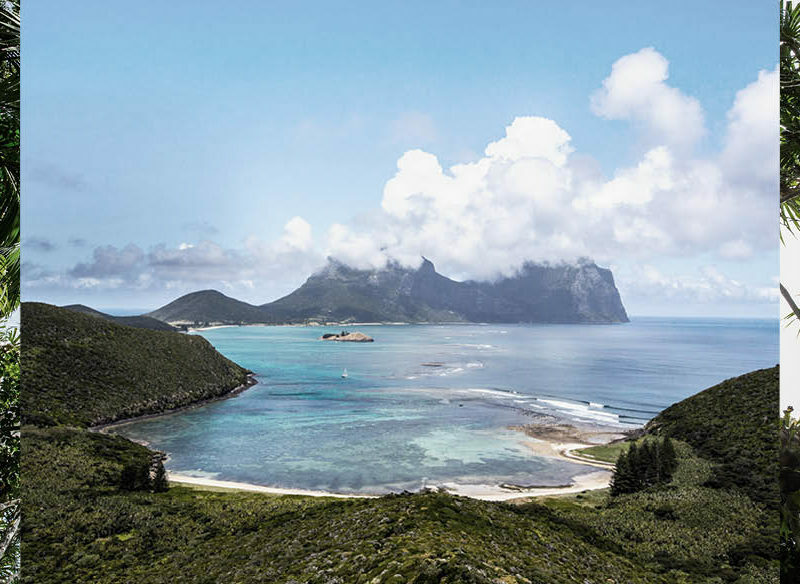 The twin peaks of Mount Gower and Mount Lidgbird rise as if from the ocean as you approach Lord Howe Island. Hulking, green lumps, they loom as though they harbour millennia of intrigue. It’s a fitting location for the lair of a Sean Connery-era Bond villain, or for a superhero to convalesce following their latest universe-saving efforts. But perhaps what their sight most easily summons to the imagination is the Jurassic. My first impression of Mount Gower was that it seemed to glower moodily in the distance, peering from beneath a fringe of mist, simultaneously daring you to approach and inviting you to f*** off. After a while, I began to see that while the mist gives the impression of warning, really Mount Gower just has its head in the clouds. The precipitation inspires a dream-like state, protecting its wildlife (like the petrels) and cultivating the enigmatic mist forest that hikers brave dizzying heights and sunstroke to marvel at. At a formidable 867 metres, you can’t take it on without a licensed guide. Even with one, you might find yourself weak-kneed and clinging to craggy crevices in fear of the sheer cliffs. Perseverance is well-rewarded with that fulfilling sense of self-satisfaction, so I’m told. As someone who trembles like a just-hatched chicken at the thought of a Ferris wheel, I wasn’t up to the challenge… this time. Those not handicapped by vertigo can now climb all seven peaks of Lord Howe Island, including Gower, as part of the Great Walks of Australia. Partnering with luxury accommodation Pinetrees, you can exhaust yourself over five days, retiring to pure comfort each evening. The promise of a good bottle of wine at the end of a day’s activities might just be enough to coax you up and down even the most challenging of peaks. Remember the feeling of holidays as a kid? The sunshine days filled with adventures on bikes, minimal parental intervention and the feeling that there were mysteries that only you and your new mates could discover. Those friendships formed on the tennis court and common areas of the resort were extraordinary in their fleeting intensity. Part school camp, part Lord of the Flies, you’d return to your parents at sundown with sticks in your hair, mud caked up your shins and kids-only secrets behind your smile. You’d scoff down your dinner as quickly as possible to return to your intrigues that seemed eternally important. This nostalgia sweeps over me as I sit on the dining patio at Pinetrees watching new arrivals shyly edge towards a group of two-day firm friends. I’m here during school holidays and am told there is a record number of children this week (usually the ratio of children to adults is kept to a minimum). But apart from at breakfast time, you wouldn’t know it. Once the last cornflake is swallowed, the kids scatter, leaving the adults to enjoy a second coffee and plan their own adventure. Pinetrees has had five generations to perfect the guest experience. Originally called The Pines, the lodge first began taking guests in 1895. Since then, it has passed down through family, modernising as it went, until it reached sixth-generation heir Dani Rourke (daughter of island legend Pixie Rourke) and her husband, Luke Hanson. Any hotelier and restaurateur will tell you that the most imperative and difficult element to get right in hospitality is culture. Culture cascades from management, to staff, to guests. If there’s a kink in the hose, nothing flows freely. As TripAdvisor’s number-one hotel in Australia for 2017, it’s obvious Pinetrees is adored. You need only spend one night here to understand why the lodge receives so many boomerang guests. It’s in the attentive staff that welcome you like an old friend, the sense of community, the incredible food, and simple but elegant rooms. Once you meet Dani and Luke, the source of that culture is evident. Dani’s preternaturally calm demeanour is complemented by her husband’s puppy-like exuberance. Life has a perplexing way of altering your plans, and it was tragedy that led Dani to taking over the family business. Her brother, Harry, was in line to be the next Pinetrees owner before his life was sadly cut short by a motorbike accident on the island. After the death of her mother, Dani and Luke moved to Lord Howe permanently, eventually buying out the remaining family and turning Pinetrees into the success it is today. Dani couldn’t have found a better match with whom to run the dynasty. As an ecologist and irrepressible outdoorsman, Luke’s love for the island and its wildlife is joyfully relentless. Barely half-an-hour after picking me up from the airport, Luke has me taking ‘a little walk’, which turns out to be a hike up Malabar on the north end of the island. By the end of my stay, I’d learnt to translate Luke’s ‘little’ into ‘fairly sizeable’, and ‘not too hard’ to ‘significant effort’. I returned to Pinetrees exhausted each evening with sticks in my hair and mud up my shins, and I loved every minute of it. The underworld of the lagoon is quiet. From above the water, it’s hard to describe its beauty without wandering into hyperbole. Cue dream sequence-like glassy water of that azure colour Italians are crazy about, white sands and incredibly green sub-tropical vegetation. The twins loom in the distance, reminding you this isn’t some forgettable Pacific isle, but a treasure of World-Heritage standing, in New South Wales, no less. It’s like this through spring and summer, but in winter, when the guests have gone and gusts of wind pummel the waters, Luke says he barely even glances at it. It’s hard to imagine a steely, unremarkable lagoon and I can’t say I care to. Back to what lies beneath, though. Slipping below is like entering one of those souvenir snow globes, the colours in the contained scene seeming exaggerated and impossible. But, here in the southernmost reef in the Pacific, the right currents make it possible, enabling more than 90 corals and 500 fish species to live. I would like to say thrive, but reefs hinge on a delicate balance and the effect of climate change on water temperature does create a degree of anxiety about this reef’s future, even if less so than its northern counterparts. Today, though, it’s as if a mad creative genius has been let loose with a pack of pastel highlighters down here. The corals are iridescent in soft purples, blues and greens. The fish have been gifted the same madness. Disguised as a fish myself in my wetsuit and flippers, I do my best to fit in with the locals. I come face to face with some curious bookfish, tail a gang of many-spotted sweetlips, and count numerous parrot fish and double-headed wrasse. So peaceful and immersive is gliding over the coral apartment blocks that make up snorkel site Erscott’s Hole that you could forget time. It seems irrelevant, except it’s not. I eventually remember to pull my head out and check my bearings. I’m last back on the boat. I’m clutching two endemic kentia palms that I’ve bought from the airport cafeteria. Still today considered the most beautiful palm in the world, its exotic plumage was favoured in English parlours of the 1800s – an effect I intend to emulate in my city flat. I’m hoping my saplings will remind me of plunging into the clear Herring Pools beyond Old Gulch, or gliding amid fish at Ned’s Beach on this island paradise. I’m also hoping the hyper-colour imprint of this place will never fade from memory. Pinetrees offers beautiful, recently refurbished rooms, suites and cottages. You can time your trip with one of the special weeks organised by Pinetrees, such as a wellness week with Charlotte Dodson or a food and wine week. Pinetrees is closed from the end of May to the beginning of September each year. There is an incredible amount to do from hikes, to fishing, snorkelling and diving (these can be organised through your accommodation). Have a go at calling down the Providence petrels at Little Island at dusk, hike to the mist forest on Mount Gower, or simply roll out a towel and spend the day at Ned’s Beach. If you like the look of a Lord Howe Island getaway, make sure you check out our Lord Howe Island travel guide, so you can ensure you read up on the very best the region has to offer!